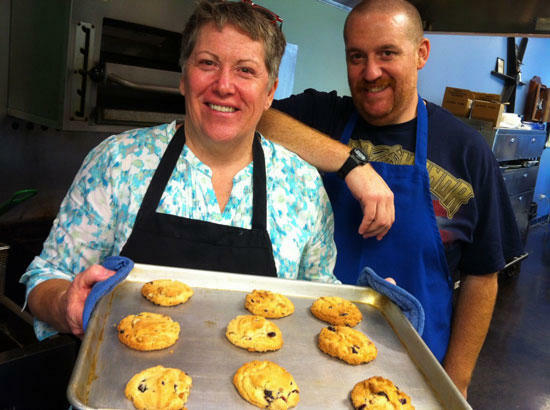 Wanda Thompson and her son Aaron Thompson show off their cranberry-pecan Moonshine Cookies at The Blue Porch. ome things are just meant to be, like Moonshine infused icing on a blue berry bread pudding. If that sounds amazing, wait until you take a bite of this and other tasty treats being whipped up in The Blue Porch at the Art Center of Cannon County. Owners Wanda and Aaron Thompson have taken our authentic Tennessee Moonshine to a whole new level by baking it into cookies, soaking it into oatmeal cake and drizzling it in icing over two different types of bread pudding. By the time I showed up to do some research recently, it looked like half of Cannon County had already decided the blue berry bread pudding is a hit. There was none left, and I could see why. It’s the one treat with the most distinguishable taste of Short Mountain Shine. You can taste it in the cookies if you know what to look for. Like with most baking, there isn’t any more alcohol in these than there would be cooking with extracts. Short Mountain Distillery is a sponsor of the current performance of Mitch Albom’s Duck Hunter Shoots Angel at the Arts Center. Be sure to give yourself plenty of time to stop by The Blue Porch and take home a genuine taste of Cannon County!